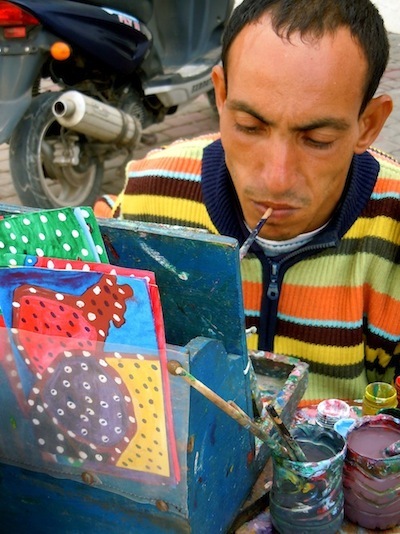 The artists of Essaouira, are known for their naive, colorful style of painting. The artists were encouraged and promoted by Frédéric Damgaard, a Danish gallerist. Indeed it could be argued that Damgaard’s intervention “created” the Essaouira artists. 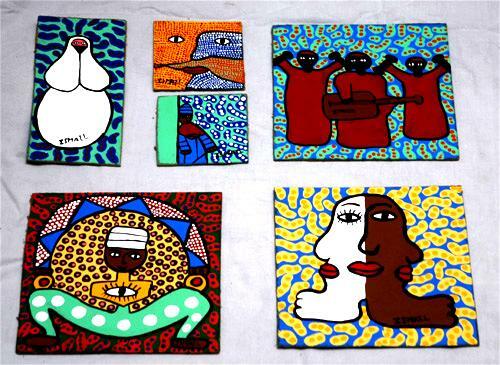 He first visited Essaouira in 1969 and became so enamored that he settled there and opened an art gallery in 1988. 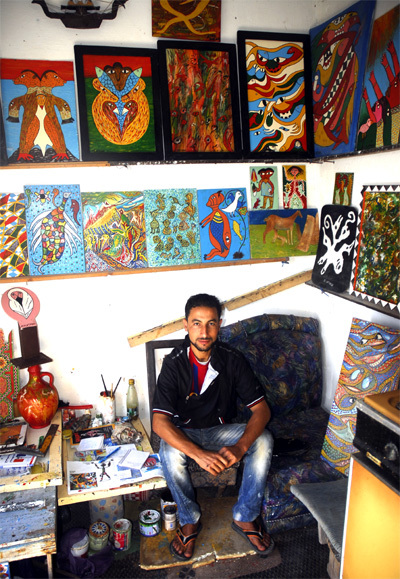 The Essaouira artists have exhibited their work in several European venues. 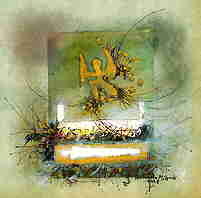 Artwork of Houssein Miloud who lives and works in Essaouira. l’Association Essaouira Mogador rend hommage, du 16 au 27 Février 201-, à l’œuvre d’Ali Menouar, artiste peintre algérien décédé à l’âge de 78 ans à Essaouira (Maroc) en février 2015. 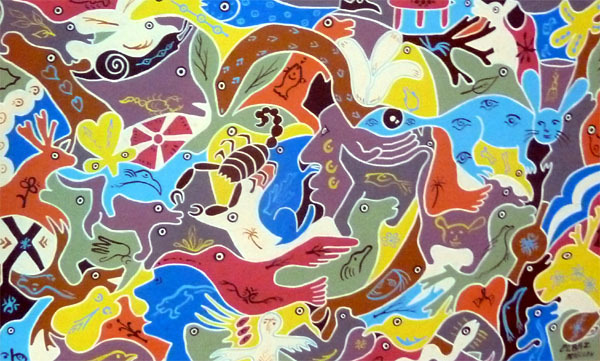 Reconnu pour son fabuleux talent de coloriste, ses toiles ont fait le tour des galeries d’art internationales. Sa fille Fabienne Menouar, artiste céramiste, présentera également à cette occasion ses œuvres. 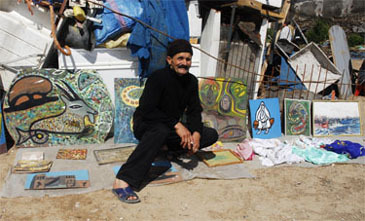 He has his studio and workshop in the Joutiya beautifully located at the shore of the Atlantic Ocean. for over 30 years. 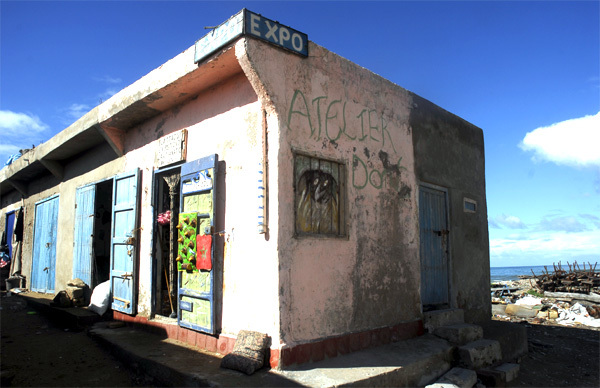 He has his gallery in the "Jotiya"
where he exibits his signed paintings.